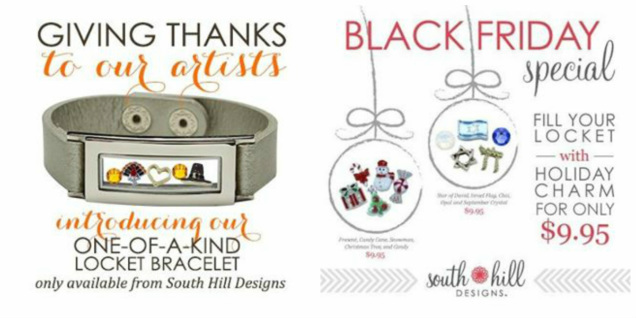 Black Friday Jewelry Sale from South Hill Designs Cute Jewelry! Deals and Steals! Who doesn't love a good deal? And for us deal-seekers, what is more fun than Black Friday? I personally have clocked many hours at the mall, during all hours of the night! But this year, there is no reason to get out of your jammies on Black Friday, because South Hill Designs has your Black Friday Sale that will get you tons of credit! Hop over to www.southhilldesigns.com/cutejewelry, because on Black Friday 2013, we are offering our five Christmas holiday charms, regularly $25 total, for only $9,95!!! That is a 60% savings! Fill your Glass Floating Locket with Christmas Holiday Charms, and be good to go! Or buy a Glass Floating Locket for a friend or loved one, and use this Black Friday deal to fill their Glass Floating Locket! When it comes to cute holiday charms, South Hill Designs Christmas Charms cannot be beat! This South Hill Designs Cute Jewelry Black Friday deal includes the Candy Cane Holiday Christmas Charm for Glass Floating Lockets, the Christmas Tree Holiday Christmas Charm for Glass Floating Lockets, the Peppermint Candy Holiday Christmas Charm for Glass Floating Lockets, the Christmas Present Holiday Charm for Glass Floating Lockets, and the Snowman Holiday Charm for Glass Floating Lockets. I can tell you from personal experience, these charms are adorable! And you can use some of them for other occasions! The Peppermint Candy Holiday Christmas Charm can be used in a Halloween Locket, while the Snowman Holiday Christmas Charm can be used all winter! The Snowman Holiday Christmas Charm looks adorable with our genuine Swarovski Crystal Snowflake Charm and our Ice Blue Pearls! We also have a Black Friday Special for Hanukkah! A $25 value for only $9.95! You get the Star of David Charm, Blue (September Birthstone) Genuine Swarovski Crystal Charm, Chai Charm, Opal Swarovski Crystal Charm, and Israeli Flag Charm! Mix and match with our Ice Blue Pearls, or add a couple more Swarovski Crystals for a gorgeous Black Friday Steal! And don't forget to pick up your Locket Bracelet during our Black Friday Sale, and get all of your Christmas presents from South Hill Designs! So don't forget to go to www.southhilldesigns.com/cutejewelry on Black Friday (November 29th, 2013) to get 60% off our Christmas Holiday Charms! Such an awesome Black Friday sale!